Most of you have probably seen the Novant Health commercial promising a doctor's visit via the web from the ease of your desk chair (or lake house deck as the commercial depicts), but have you ever wondered what the real feasibility of telemedicine is? How likely is it that your medical condition can be accurately treated via a web chat? How can telemedicine be practically applied? 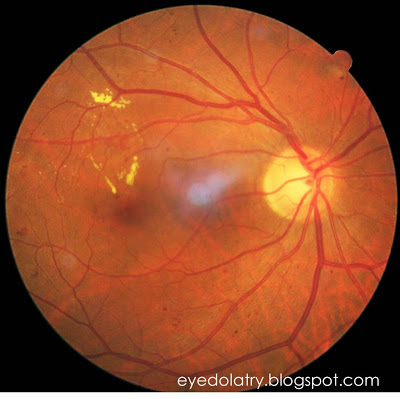 patient's diabetic retinopathy in person! The truth is, I do think there is some room for telemedicine in our future, and I am not the only eyecare provider that sees its merits. Wills Eye Hospital (the optometrist medical bible is named for it, by the way) has a retinal photography telemedicine department, and they aren't the only one. Similar strategies were being used in the VA Hospital system when I was rotating through several years ago. What's so great about retinal telemedicine? Photographs of the retina can be used to track changes for various conditions, like diabetic retinopathy and macular degeneration. While you can't replace a one on one visit with the doctor altogether, when monitoring a condition for changes, telemedicine can be a great resource. The patient would be able to come to the clinic with more flexibility since they wouldn't have to be scheduled into the doctor's patient care hours, a technician would be trained to take the photograph, and then the doctor would have a dedicated period of time to review the collected data and images, and then inform patients of their results. The photography is utilized as screening tool (typically some manner of vision check and compliant questioning would also be recorded by the technician to help detect any other issues). If changes are seen in the photograph (or the patient has specific complaints to be addressed), then a live visit with the doctor would be necessitated. If the retinal image and vision are stable, the doctor may decide to push back a live follow-up visit. This method of treatment has proven to be effective in recent studies: at the European Retina Congress, there was a 90% agreement between treatment plans of in-office ophthalmologist visits and telemedicine reviews for a group of patients being followed with macular degeneration. A photograph can tell the doctor so much about the ocular condition, and a trained doctor can catch the signs of even the smallest of changes. There is a large gap between photo-monitoring retinal conditions, and ridding the need for any in person office visits with your eye care provider, so I am not purporting that a photograph will replace all patient care. The retinal evaluation is just one small aspect of the comprehensive ocular exam, and you can't evaluate the entire retina without dilation and a live, in-office view of the retina by the doctor. But conditions like macular degeneration and diabetic retinopathy do result in the need for more frequent monitoring than just yearly examinations, and telemedicine may help reduce the burden on the healthcare industry by offering patients convenient times without double or even triple-booking doctors. I don't expect the type of clinical care that the commercials depict where a doctor seems to be on duty full-time with web access is the way of the future--the type of care that can be provided without direct evaluation is very limited. But the industry around us will continue to change, and telemedicine in eyecare may become more and more utilized as our population ages and more people are diagnosed with macular degeneration and diabetes. The health care industy is an exciting landscape, and it is fascinating to see how new technology can entirely change the face of our standard of care! Very interesting article. I agree its the future of Optometry. My main question is billing the visit out. Will this technology lower the cost of fundus photography? I would imagine you would bill Fundus Photography and no medical office visit. My understanding of Fundus Photography is that the image is not the chief thing you are billing, but the interpretation of the image and treatment plan that it influences. That's why when you bill Fundus Photography you have to have an interpretation documented for the photo. With that being said, I think utilizing this type of imaging outside of an office visit would be a reason to keep Fundus Photography reimnbursement high by insurances (especially since they wouldn't also have to pay for additional office visit charges), and definitely should not result in a decreased payout. But you never know with health care.